Hernando de Soto and his party crossed the Aucilla River sometime in October of 1539 and celebrated Christmas in what is now Tallahassee. Many things in Florida have changed since de Soto passed this way, but when the 2015 Panhandle Outdoors LIVE! 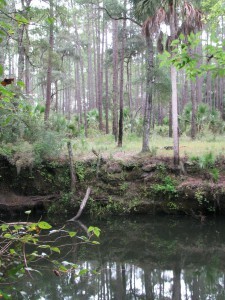 tour hiked the Aucilla Sinks portion of the Florida Trail this September, many things had not. 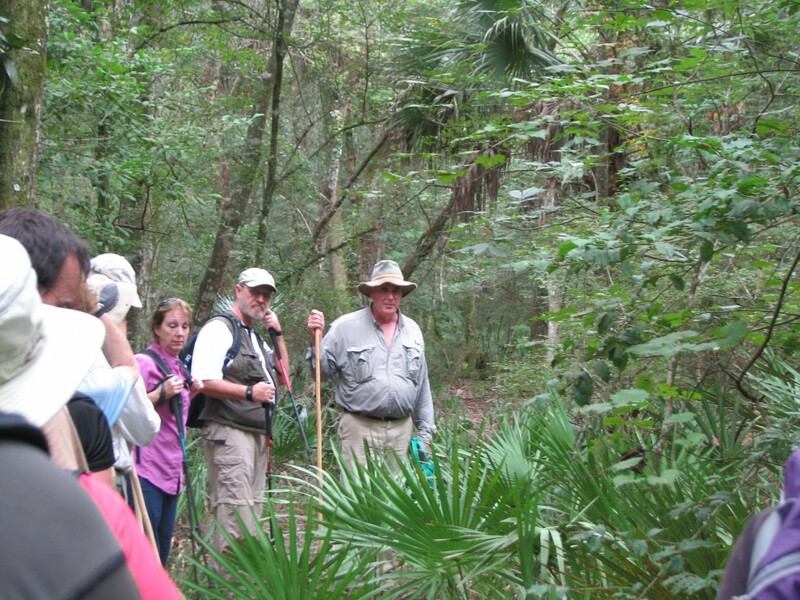 Panhandle residents explore the area of Aucilla Sinks with local guide David Ward. Yes, the trail is maintained and marked by the Apalachee chapter of the Florida Trail Associations and there are bridges in spots, but the blood sucking bugs that bedeviled deSoto haven’t dissipated. 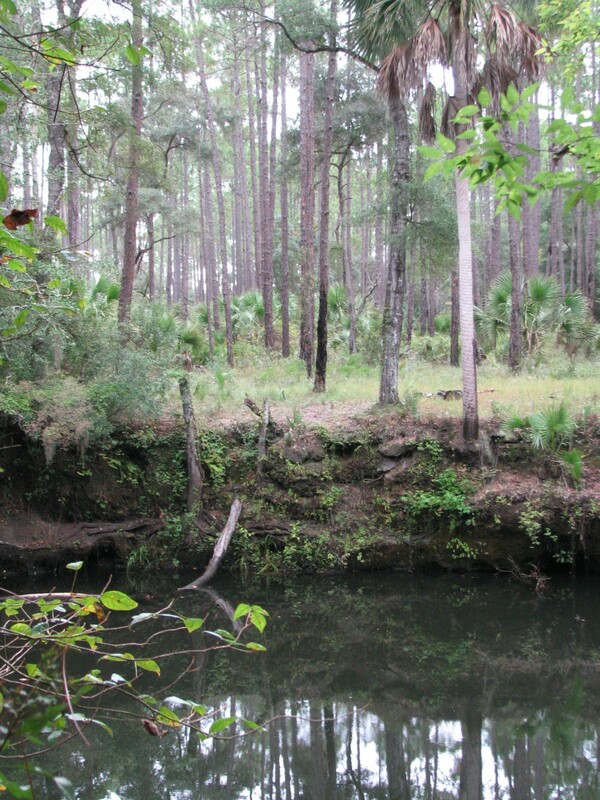 More importantly, the spectacular and distinctive area provides a relatively easy hike that reveals the connections between geology and hydrology in an area with little disturbance by the settlers who followed the first Europeans into North Florida. 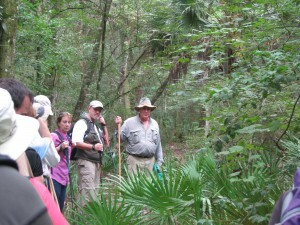 Hikers got up close and personal views of the Karst topography found in North Florida. 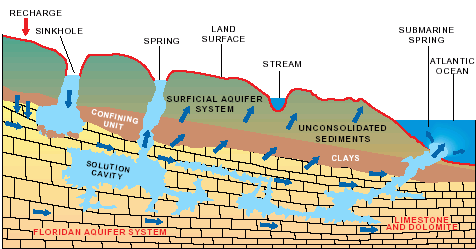 This topography occurs as the tannic rivers and runoff dissolve the underlying limestone on their way to the aquifer. These connections and voids in the bedrock allow the Aucilla River to “come and go” above and below ground as it moves to the Gulf of Mexico as do all rivers in the Suwannee River Water Management District other than the Suwannee. 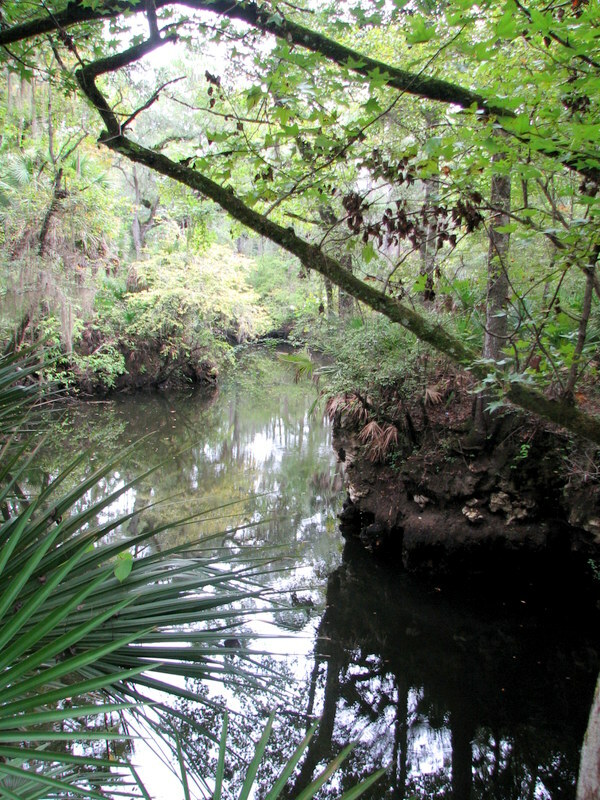 One of the many locations where the Aucilla River “rises from the limestone caverns beneath the earth. Information on this section of the Florida Trail is available from the Apalachee Chapter of the Florida Trail Association, the Suwannee River Water Management District and Florida Fish and Wildlife Conservation Commission. Humidity never went below 80 percent during our late morning, early afternoon trip. November will likely provide less buggy and surely less muggy conditions. If you’d like to learn about this area from the comfort of your recliner or need some extra encouragement to strike out on the walk, check out this program previously broadcast by WFSU TV. http://wfsu.org/dimensions/viewvideo.php?num=184 Either way, you’ll know more about Florida’s spectacular natural world. A portion of the Aucilla River flows through a landscape of dramatic and unusual geologic formations. Join us for this tour to see an amazing sequence of sinks and river rises, created as the river alternately disappears into the underlying karst and resurfaces. Fringed with moss-draped trees and native palms, the sinks are pools of black water easily viewed by walking the surrounding embankments along a 4.5 mile-segment of the Florida National Scenic Trail. Your guides will cover the human history of this wildlife-rich Aucilla River landscape, which extends back 12,000 years to the Pleistocene epoc when mastodons, saber-tooth tigers and other large mammals roamed a landscape that resembled the African savannahs of today. The 1983 unearthing of a 12,000-year old mastodon tusk exhibiting cut marks— evidence of slaughter by humans — provides some of the earliest known evidence of man on this continent. Please feel free to share this announcement and attached flyer with those you know who may be interested. And we hope you can join us for this trip if you’ve never seen this beautiful, mysterious place. This tiny sinkhole appeared in my yard during the heavy March rains. Although only 3 feet wide, it was 5 feet deep. 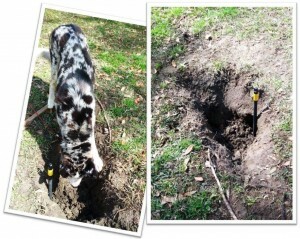 My dog looks both curious and jealous that it wasn’t one of the holes he’s dug! During our heavy March rainfall events a tiny sinkhole appeared in my yard. While it was only 3 feet across, it was over 5 feet deep! After reading about the various types and causes of sinkholes, I decided it was most likely a “subsidence incident” sinkhole caused from collapsed underlying organic material (perhaps an old tree root?). Read on to learn more about sinkholes, their causes, and their prevalence in Florida. 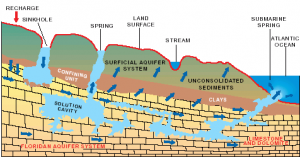 According to the United States Geological Survey and the Florida DEP Bureau of Geology, panhandle Florida’s limestone bedrock is overlain with from zero to over 200 feet of sediments. 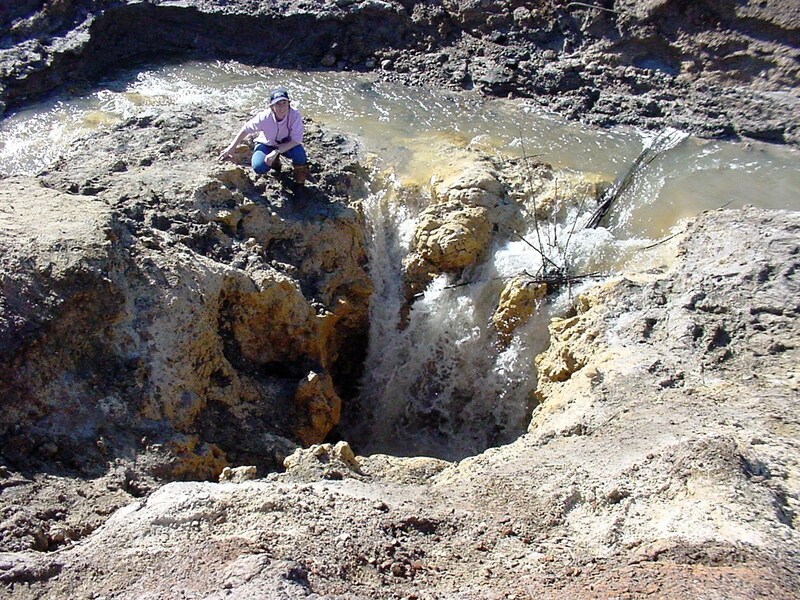 The depths and types of these overlying sediments are major factors in the prevalence and characteristics of sinkholes and other karst features. View this map to see an overview of sediment depth and sinkhole activity in your county. Leon County, in eastern panhandle Florida, boasts its geologically active Lake Jackson, not only for its famous largemouth bass fishery, but also for its periodic disappearances through underlying sinkholes! 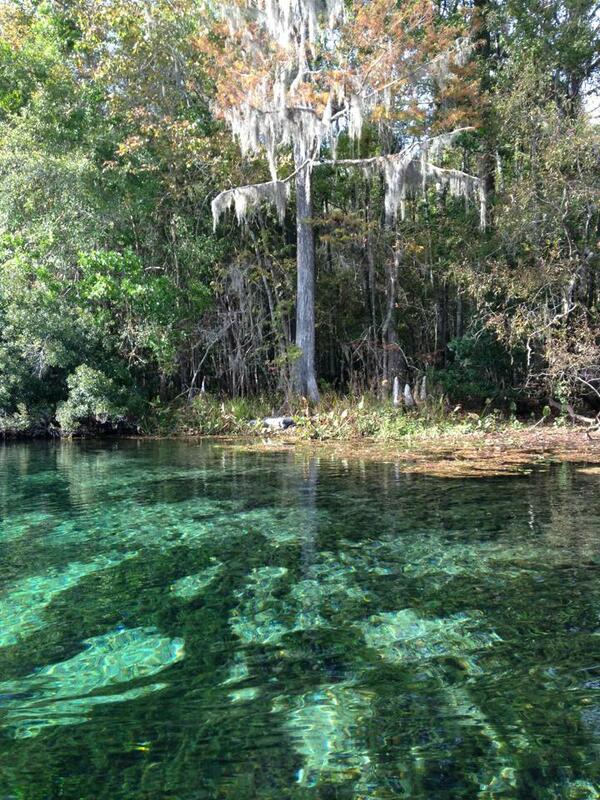 This 4,000 acre lake has a history of virtually draining through underlying sinkholes about every 25 years. Its most recent draining event was in 2006. This is the sinkhole that drained Leon County’s Lake Jackson in 2006. The author is kneeling at its edge. Is there a database showing all sinkholes in Florida? Our insurance company has informed us that the area where we are going to purchase property is listed as a sinkhole area. What does this mean? What can we do about it? Should we buy in that area? Florida DEP, Bureau of Geology, All about Sinkholes, Questions and Answers.